Planting a hedge is an investment that will bring years of benefit and autumn is one of the best times for planting shrubs and trees. Even though containers offer convenience and the possibility of year-round gardening, autumn is still nature’s time. The soil conditions tend to be right for establishing new plants and the slowed growth rates of most plants result in them being in optimum condition for being moved. It’s also a great time for starting a new project, like establishing a hedge. The glories of the summer garden are past now and you can move about without disturbing beautiful displays. Hedges offer all the benefits of hard boundaries, with a few more thrown in for good measure. Not only do they demarcate your property and provide privacy, choose the right plants and they will become prickly, intruder-proof barriers that might even result in a reduced home insurance premium! Added to this, an established hedge is a better windbreak than a solid fence as it filters and slows wind (fences can cause turbulence and even accelerate wind). Hedges also intercept dust, litter and the microscopic particulates in the air that you can’t see, but which can cause a range of respiratory illnesses. Our new ideas for hedging this autumn include using Berberis thunbergii and Ilex aquifolium (holly) to create beautiful, interesting and effective boundaries. Both offer the prickly benefits that intruders hate and insurers love. Both provide flowers in spring/summer and are berry-bearing, which offers additional visual interest. The berberis is deciduous, and will respond well to pruning into tidy shapes, if that’s the kind of hedge you want. 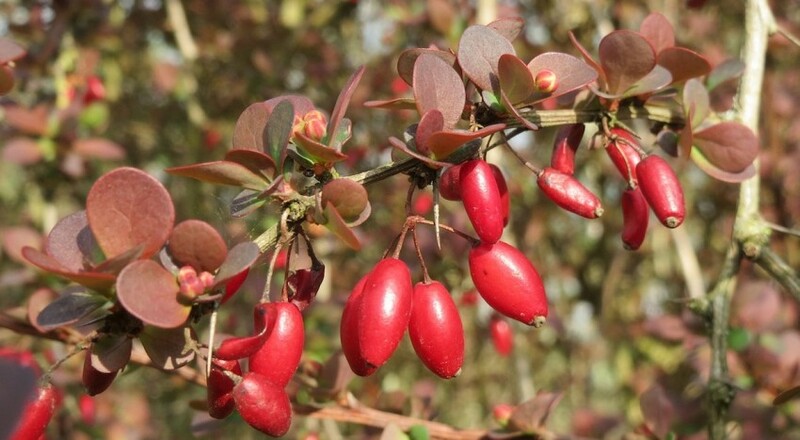 The leaves of Berberis thunbergii come in a range of colours from bronze, red-purple, to yellow, depending on variety. It will do well in almost any situation or soil and its dense habit and compact growth (it will only reach a little over 1m in height) make it ideal for hedging. Ilex aquifolium is evergreen, which brings the benefits of year-round foliage. It’s very hardy and great for winter interest. Holly grows well in coastal situations, areas with atmospheric pollution and in deep shade. Again, it’s perfect for growing into a hedge of up to approximately 1.5m and can be cut back hard when needed as new growth comes from old wood. It’s easy and fun to establish a new hedge and the rewards come quickly. Many retailers now sell ‘hedging packs’ where you’ll make a saving per plant from the multiple purchase. Buy sufficient to put a plant every 40–60cm (depending on species/variety and size when planting) along the line of the hedge. Mark out the desired line of the hedge and cultivate the soil, improving it with organic matter as you do so. Water-in new plants as necessary (and protect from rabbits). What are you waiting for?